There are so many incredible resources out there to keep students engaged. Here is a brief overview of a few that I have tried recently. This game is fast-paced and teacher-driven. Students are generally motivated by the competition, music, and running timer. See Rachel Barry's blog post for details on how it works. A big shout-out to Rita Sayre who first presented this game to our staff at our last in-service day. Quizlet Live requires very little prep and is easy to use. The beauty of this game is that you don't have to create quiz questions because you can use flashcards that you have already created. Students go to https://quizlet.com/live and type in the teacher's code. As students sign in, they are automatically assigned to a team. 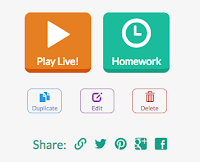 Open any flashcard set and click "Live"
Quizlet Live assigns students to teams of 3-4. Students then move to sit with their team since the correct answer only appears on ONE team member's screen at a time. Teacher computer can project the leader board. One wrong answer sends a team back to the beginning. At the end of the game, team members see what they knew well and what they need to work on. If you are trying to have small groups play (for stacked classes or stations), you must have at least 6 kids to play. Thanks to my colleage at RMHS, Sara Kahle-Ruiz, for telling me about these next two resources. 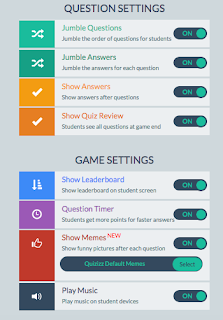 Like Kahoot, Quizalize allows you to create your own quizzes or search ones that have been created by other teachers. Some of the quizzes in their "marketplace" are free and others are paid. Create an account at quizalize.com. Make up a title. Add multiple choice questions and answers. You can also assign any quiz in Homework mode. In homework mode, the teacher can click a "mastery" setting. Any question the student misses will be repeated (multiple times). Each class has its own code. Student's go to quiz.al and enter game code. Students will be asked to enter their name. When they do, Quizalize saves it for next time. The second time they play, they will choose their name from a menu. Have students choose a name they will remember. Start the game. In Homework mode, students start when they are ready. When a student gets a wrong answer, an explanation will appear if one was entered when creating the quiz. Quizalize now works through Zzish. It can be cumbersome to toggle between Quizalize and Zzish. Both teacher and students can see a report at the end of their results. If they were working in "mastery" mode, the report shows how many attempts it took them to get an answer right. Like other on-line quizzes, Quizizz allows you to create your own questions or search quizzes created by other educators. Click on "Create" to begin your own quiz. Click on "Public" to browse published quizzes. If you find one you like, you can duplicate it, then edit or play as-is with your class. 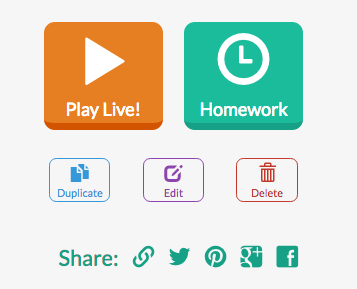 Click on "My Quizizz", select the one you want to play, and either click "Play live" or "Homework". Students will be given a class code. They go to join.quizizz.com and enter the code. No need to make an account. Assign any quiz as a game or homework. 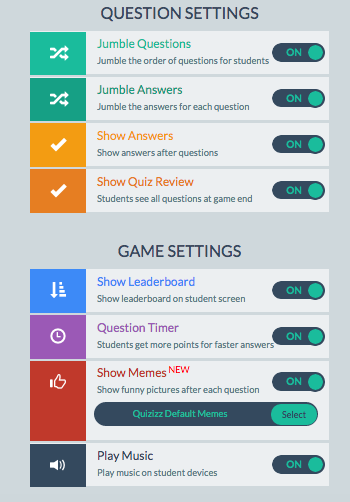 Quizizz gives each student an avatar. They need to enter a name. Since the name is displayed to all players, you may want to have them enter initials. Kids can work at their own pace. Points depend on speed and accuracy. They can see the avatars of other students move across the screen as they answer. Teacher can create memes for right and wrong answers. The funny memes that pop up after each response help keep kids engaged. Students can see all questions at the end of game to evaluate how they did. Quizizz displays both their answer and the correct answer. Reports are saved in your account so you can go back and view them when you want. In homework mode, a student can repeat the quiz. A new avatar is assigned and they can race their previous score. Students can see their results from their first try when they play again. Students can see results from both attempts. Have an idea for another on-line quiz? Please share!